Ye Olde Shippe's Plans. Posted by Shan Yu. Pictures, floorplans and schematics of the thousands and thousands of ships that will appear in this game shall be posted here. Also, any general ship-related information (such as cargo manifests, cabin assignments, ship descriptions etc.) shall be posted here. This message was last edited by the GM at 16:49, Wed 15 Sept 2010. This message was last edited by the GM at 15:50, Tue 26 Oct 2010. Besides working well as a transport for mechanized ground forces, the ALST saw a good deal of service as a medical evacuation vessel. In this configuration, the aft cargo hold was converted into operating theaters and bunks for injured or wounded, and obviously, weapons were removed. This configuration allowed for the transport of up to 24 patients and 12 medical personnel. After the war, the ALSTs that remained in service (some 2,000 of 8,000 produced) were stripped of their more complex military sensors, autonav systems, and weapons, and then auctioned off. Historically, this ship is probably best known for several beachhead landings, the most spectacular of which was the final assault on Serenity Valley, where some 100 landed simultaneously, just behind a wave of support fighter aircraft. 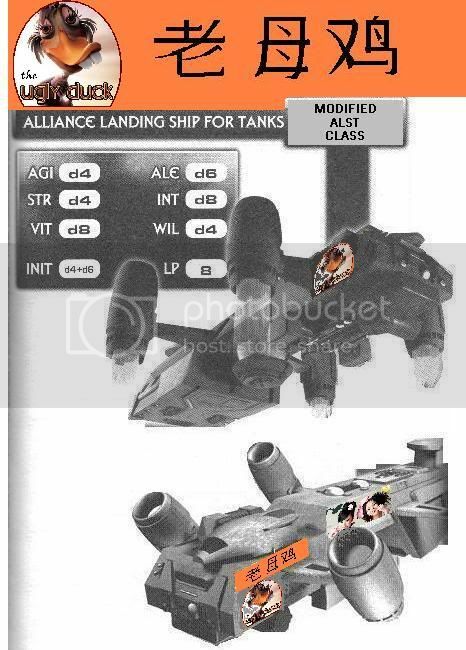 It is somewhat ironic that they were also the vessel primarily used to perform med-evac of both Alliance and Independent forces when the war was over. The ship never won any prizes for beauty. As is often the case with military hardware, it was designed for utility, not looks…its blocky appearance being the antithesis of the sleek, aesthetically pleasing designs that prompted so many Captains to lovingly christen their vessels with sentimental feminine monikers. “The Ugly Duck” has had its drive systems modified to improve its performance, and additional living quarters have been added. 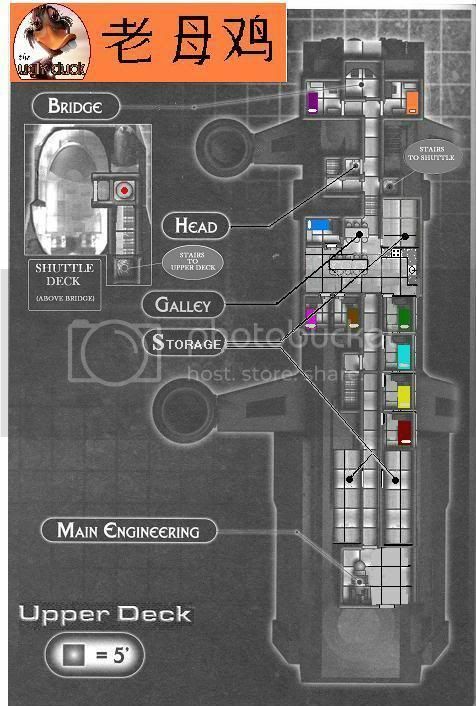 The cargo hold has also been modified as an area primarily for passenger use instead of cargo. Slightly faster than standard ALSTs, it is also more prone to mechanical breakdown and malfunctions. Front airlock - Outer airlock door swings outward, inner airlock hatch is heavy sliding steel door with porthole in the center. Ventral airlock (in floor near front airlock) - The hatches to this small airlock are heavy swinging doors. The outer door swings outward (downward), and the inner door swings inward (upward). Neither hatch has a porthole. Shuttle deck airlock - Heavy duty sliding doors, each has a porthole. 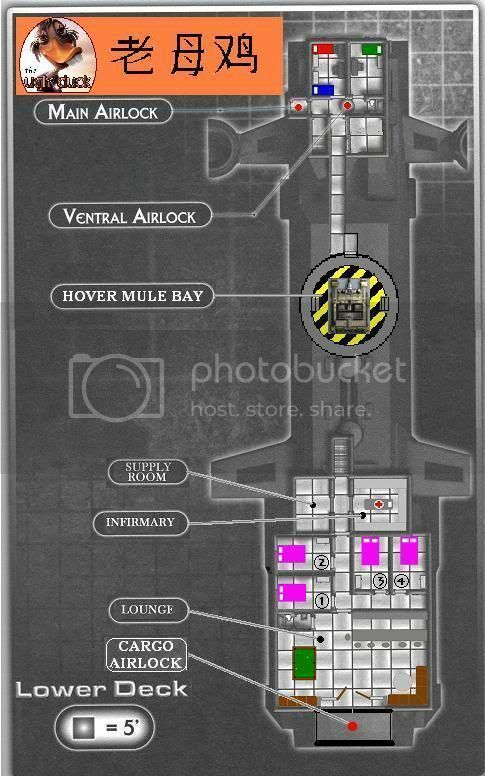 Hover mule bay - The bay is NOT designed to be an airlock, though it could actually work as one. The hover mule rests on the floor (the black and yellow striped area). When needed, the mule is unloaded by lowering the entire floor of the bay. The floor becomes a platform that lowers on 4 hydraulic jacks, and when the platform hits the ground, the mule can just be driven off. ---The innermost doors leading to the lounge are wooden doors that swing inwards. They have glass window inserts. These doors are designed for aesthetic purposes only. ---Just outside of the wooden doors are the inner main airlock doors. These are the same as the doors in Serenity, with heavy-duty steel doors that open in the middle and slide outwards. There is a porthole in each door. ---The outside airlock door is actually the ramp. Once again, think of the cargo bay doors on Serenity. The exterior ramp lowers, and there is a passenger door set in the middle of it that swings inwards when the ramp is raised. This passenger door has a porthole. There are a few heavy duty, airlock-style hatches that are designed to provide a secure barrier in case of hull breach. The cockpit, the engine room, and the hovermule bay have such hatches. The door in the hallway between the passenger cabin area and the infirmary area is also such a hatch, as is the one just opposite the door to cabin C-10. These hatches have a porthole in the center, and are sliding doors. All cabin doors (crew and passenger) - Lightweight sliding metal doors. Other compartment/passageway doors (except engine room, cockpit, hovermule bay) - Lightweight sliding metal doors. The door to the head in the lounge is a wooden door that swings inwards. This message was last edited by the GM at 04:31, Thu 11 Nov 2010. Every cabin (passenger and crew) has an intercom. These intercoms can communicate only with the cockpit. The engine room and infirmary also have intercoms that only communicate with the cockpit. ---next to forward airlock, on wall next to cabin C-10 door. ---just outside hover mule bay, on wall next to door. ---in lounge, on wall next to head. ---rear (main) airlock, on port side wall between the wooden doors and the inner airlock door. The controls for the ramp/airlock are also here. ---galley, on wall next cabin C-5, next to passageway leading back to engine room. In addition to the above details, the cockpit has the capability to open a channel to all intercoms in the ship...basically a public address capability. The cockpit, cannot, however, select several intercoms while not selecting others. The cockpit can contact either a single intercom, or all of them at once. The cockpit can also route any incoming Cortex wave to any intercom, and can act as a relay to any intercom that wishes to send an outgoing Cortex wave. Private Cortex terminals DO NOT have to go through the cockpit to transmit or received waves, but their range is much more limited than the ship's communications array. Any transmission from within the ship will, however, be detected in the cockpit (as it was in the Firefly pilot episode). These functions can be operated from either the pilot or co-pilot seats. There is a small communications station in the cockpit, once used for the military comm array. There's a fold-down seat and several small cabinets and lockers that hold various manuals, lists of frequencies, maintenance/repair logs, etc. While the military hardware has been removed, there are still basic controls for adjusting the ship's comm array and for monitoring the operating status of the equipment. Modifications to any of the above may conceivably be attempted by a technician. This message was last edited by the GM at 01:04, Tue 16 Nov 2010.